I'm anticipating a bit.. but let's assume they do the dirty before midnight. I presume the cracker plant gets public $$ to reindustrialize the region when they finally get around to passing the state budget. They just are not talking about reindustrializing Larimer this time around. I bet those Google folks have one of those newfangled 3-D printers up there these days. If they use it regularly, can we classify them as manufacturing workers? I know the media confusion story of the day is all about the momentary misreporting that got the story of the Supreme Court ruling yesterday backwards. Yet there was some real misoverestimating across the nation over the latest census numbers that were released yesterday on municipal population estimates for 2011. Which means basically that there was very little 2011 data that went into these numbers. Without using new information it begs the question of how much the results should be interpreted. They basically took the estimated county level population data and allocated it to smaller municipalities based on the 2010 Census. They also just assumed that all the growth was even within counties. That assumption, that center cities grew the same as their immediate suburbs, produced the results being reported on everywhere. There appears to be no other supporting analysis for the assumption, it is just an assumption. Other than that, there is no new information here to lead to the conclusions making their way into the headlines. It may have even tripped up the experts out there because the Census folks explain they changed their methodology just for this particular data release, and are likely to change it again before next year's update. But you have to read into their methodology notes to realize the changes for just this year. This is all probably an example of why some of us have the bad habit of reading footnotes first. Was there any new growth in cities? Not at all. Or at least there is no data in any of this to tell us one way or another. The Census basically took the growth that likely continued to be mostly in the suburbs and just assumed it was spread evenly between center cities and suburbs within counties across the nation. The result was that it all of a sudden appeared cities were growing faster (or in some cases shrinking less) than they have been in other data.. In reality, the new patterns were no more than an artifact of the temporary change in the Census Bureau's methodology for this data. If they had ever used the same methodology in the past, namely taking county-wide population changes and distributed growth evenly across municipalities the results would have come out the same. If these municipal estimates had been calculated this way over the last decade, they would have wound up being very much different from the eventual decennial census enumeration. So the headlines may be ok if there is data on 'cities' that are in themselves counties, but those areas are few; or in the case of New York City, multiple counties. For most cities are only parts of larger counties. Other than Allegheny County I looked at Cook County which includes Chicago and indeed both the city of Chicago and most all of its Cook County suburbs are being reported as having nearly identical growth rates since 2010. I bet that is no more true there than it isn't here. So this all may not be as egregious an error as the news cycle we once had in 2000 when population 'growth' Downtown was attributed to a big new influx of young people living in the Golden Triangle in the 1990's. The truth was that the Allegheny County Jail was rebuilt and expanded in the 1990's and that expansion more than accounted for a nominal reported increase in Downtown's residential population. The eventual increase in Downtown's population would come mostly a decade and several hundred million dollars in subsidies later. 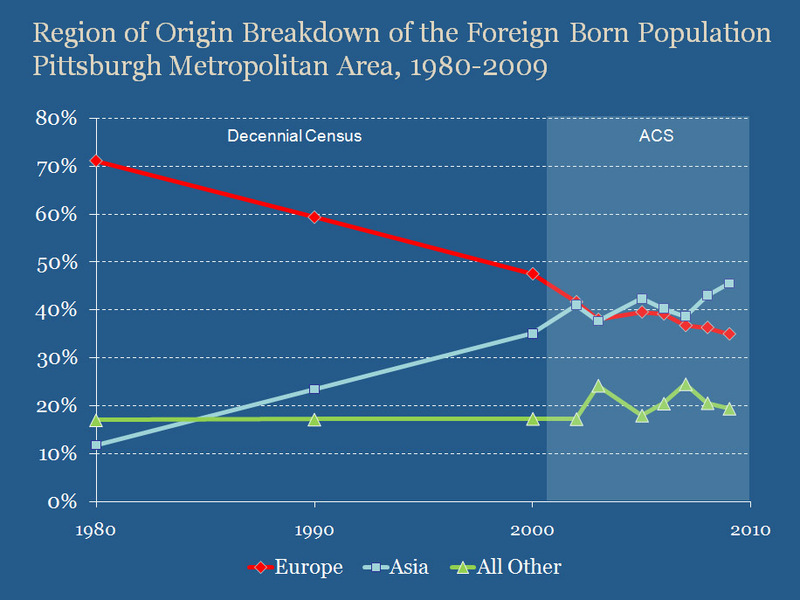 Nonetheless, this misuse of Census data is certainly more widespread and likely be misreferenced for years to come. Note update appended at bottom. So the data dump of the day is for new population estimates for 2011 for municipalities across the nation. Before anyone gets into it too much, it is one of those cases where you really want to understand the methodology before overinterpreting what the data seems to be saying. The methodology for these sub-county population estimates has changed and that is important here. In the past what happened was that the population estimates produced by the Census folks were then allocated to the smaller municipalities within each county based on the latest data on building permits which are reported monthly. This year that methodology has changed and the methodology (in previous link) is pretty honest in saying they are re-evaluating how to do this particular estimation at the municipal level. It still must start with the change in population estimated for the county, but the question is how to allocate that change to municipalites and other incorporated places within each county. To skip and simplify the wonkish details, the numbers here are in a limited sense an extrapolation of what they think was happening between July 2009 and April 2010. So really there is no information in this data about what anyone knows about what is going on between 2010 and 2011. One of those circumstance where you really need to understand your data before interpreting it too far. Especially anytime you have to deal with a change in methodology you have to be very careful about looking at a timeseries and interpreting any changes in trend. Might all reflect the change in methodology as much as any other reality. So in this case it was really important to lay out the disclaimers first. Nonetheless, this may be the headline. So yes, growth for the city is something I am sure will be picked up on. Whatever the story is with the data it starts with the change at the county level. We talked about how there was estimated population growth in Allegheny County in 2011 for the first time in a long time. 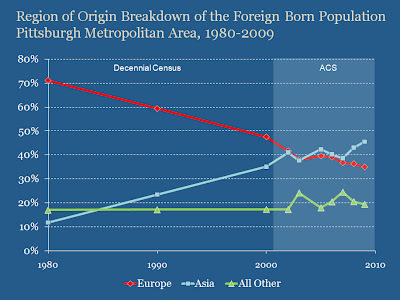 That growth is remarkable when you consider 1) we still are a place that is experiencing natural population decline, so any population gain has to be coming from positive net migration at a rate high enough to offset that and 2) Allegheny County in my look back has not had sustained positive net migration since possibly the 1920's. So for the first time in a long time there is net population gain to be allocated to the municipalities by whatever model. In this data the county went up +2,233 between July 2010 and July 2011. So it looks like the Census gnomes have allocated a population gain of 528 to the City of Pittsburgh.. or just under 24% of the gain for the county. Works out pretty coincidentially to the ratio of the city's population to that in the county. They also are giving some growth to every municipality within the county, something which I doubt is true in reality. So take it all with a grain of salt. In fact the same data is saying that Braddock grew by 3 people between 2010 and 2011 (you think they could provide us with the 3 names maybe?) I have not idea what has happened in Braddock over that year, but I am pretty sure nobody has data to confirm or deny whether a gain of 3 is the right number. It is a precision we don't have, but an artifact of the methodology the census folks are obliged to apply consistently across the nation. So the gains for any one municipality may be a lot more or less than what this particular data dump is telling us. For the city in particular there is not a lot of information being added here. Given that I still think a large part, if not most or even all of the gains in the younger population in the city is coming from increased college enrollment... the shifting trends for the city are going to be coming from trends in that population which is more controlled by the institutions themselves than other factors. and to parse the parsing even. Look closely at the data for the city I put there. Note the reason there is data for April and July of 2010 is that the decennial census references an April 1 date every decade. The annual population estimates produced reference a July 1 date every year. So you need to bridge those dates in the data. Now go look at what they are saying happened over just 4 months between April and July 2010. Nominally it says there was a fast growth rate for the city over those 4 months and then a much slower growth rate over the subsequent 12 months. Probably not what happened at all, so again don't overinterpret. So it is all more conflicted than in may seem. So if you read the methodology link I put up there they explain this about their methodology. To produce subcounty housing unit estimates, we distributed the extrapolated county estimates down to each subcounty area within a county based on 2010 Census proportions. Got that!? What it means is that there should not be any difference in the population changes by municipality. In fact in the data just out every municipality in the county grew by 0.22% between 4/1/2010 and 7/1/2011 within rounding error caused by some of the smaller populations in some of our municipalties. Every single one nearly identical.. as per the explanation in that sentence quoted methodology... every one EXCEPT the city of Pittsburgh which is nominally showing faster growth. yet the methodology is clear that there were no exceptions.. or if there were there is no hint as to where that different number is coming from. So I've asked smarter people than me to see if there is something else going on in this cycle that explains it.. or if there is some other issue/problem. I will let you know if I learn more. At the moment I am speculating that the anomalous city of Pittsburgh growth within Allegheny County is due to data on group quarters which is likely added in separately for these numbers. update 2: I think I have it. If you look at Allegheny County's estimated population change from 4/1/2010 to 7/1/2011 the "Group Quarters population" went from 35,054 to 36,233 which is a change of 1,179. If you make the assumption that almost all of that would have happened within the city of Pittsburgh and net it out of the estimates data out today.. then it works out that the City of Pittsburgh's estimated growth is nearly identical to what is being reported for each of the other municipalities within Allegheny County. What are group quarters... college students in dorms... prisoners.. military in barracks and a few other categories, but for us college students and prisoners would be the big ones. For those who have asked about the redistricting maps I put up the other day. For the moment though, I suspect the field names are self explanatory enough for now. This has the old and new city council districts with the 2010 demographics. So I guess we should have a contest for the best map or illustration anyone can make of it. Update: So I had no idea this was out there, but there is a city council redistricting page out there with some maps and data. I will tell you their maps and data is not consistent with mine. I think the new redistricting plan has left Ward 4 District 16 (which has clearly been voting in all recent election cycles as part of city council district 6) as an island unto itself separated from the rest of District 6. City Council's data sure says that 4-16 is part of Council District 3. I am told there is some fundamental confusion over whether this particular voting district is in D3 or D6.. but go look at the county elections page yourself and it is clear where those folks have have been voting in the past and it sure isnt D3. Says a lot about how much anyone at the city pays attention if you can't even agree on what precincts are in what council districts. Not something that would have gone unnoticed in Davey Lawrence's days for sure. Sometimes more than others media coverage really befuddles me. I mentioned this a couple weeks ago, and now the Philly Inquirer has now looked into it a little. But the changes in public pension accounting just enacted are at least metaphysically a big deal... and if local actuaries don't follow them, then that is a story as well. Just look at the table in the Inky's article there. You would think that just out of sheer curiosity someone would want to know what local pension funds' status would be if similarly recalculated. And note the discussion of 'smoothing' which happened in Pittsburgh the last actuarial reporting cycle for the first time and which was pretty much unmentioned anywhere. Anyway... anyone want to guess what the best funded large public pension fund is in the region if not the state? So it really has been more than just decades since we would have even been considered for a ranking in something like this. Count in score at least. Area Development magazine (always a link there on the right btw) has us ranked near the top for Prime Workforce Growth. Seriously, I am not making it up. Why you may ask. You may read the news today of the latest labor force news for the region and conclude the situation is quite dour. Yet it is now 66 months that the local unemployment rate has been below the nation's, 68 months since Pittsburgh's unemployment rate was actually above the nation's. So we have a peek at what the Fifth floor gnomes and friends have come up with for City of Pittsburgh council districts. Taking the table in the paper, which is limited to just the changes, here is what I get quickly for the proposed new city council districts. 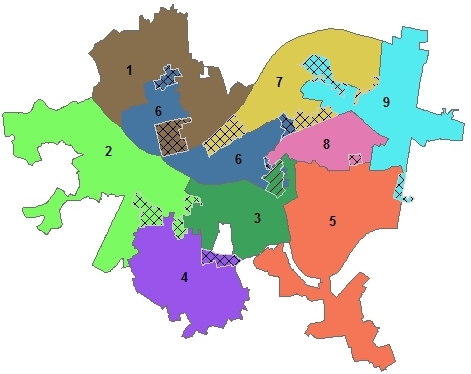 New additions to each district marked with crosshatch. Also I put this into Google maps as well. Hey... can anyone give a cogent explanation for why city council districts are not coterminus with the Pittsburgh School Distict's elected representatives. And no.. Mt. Oliver is not big enough to explain any of that at all. It is just a bit curious that the city is pretty much carved up into two completely separate geographies despite it starting with virtually the same city. 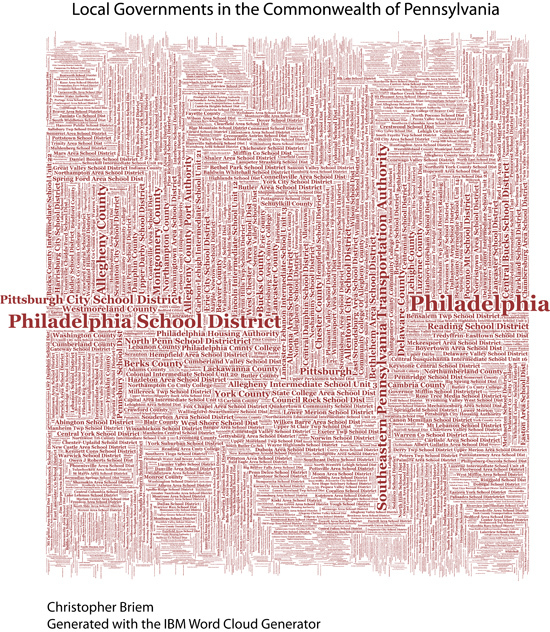 What is up with school district redistricting anyway? But.. the new map. If correct, and if the list of changes in the PG is correct... and I am wondering a bit.. then contiguousness is overrated. Just if you didn't catch it.. there has been a curious news cycle over the observation that there is a lot of real estate investment in Toledo coming from China. See Fortune: Why are the Chinese investing in Toledo, followed up by WSJ: Courting the Chinese Buyer. It's all really building on some longstanding investigative work by the Toledo Blade: Inquiry Sheds light on Chinese investors. US. Chinese real estate investment sure is something we have sure tried to encourage. A few years ago I noted the Pittsburgh connection to some Chinese real estate investing in the US. We really are the center of everything these days. Various press on that elsewhere, but nothing really here. But it is curious. Note there is the obligatory paranoia over all of this. Some may recall similar sentiment when there was a lot of Japanese investment in US real estate 20 years ago. I am not sure any of that turned out badly for the US, though it didn't work out well for a lot of the investors as I recall my history. Since real estate isn't going to be moved overseas you have to wonder what the risk is. What I don't get is that the same folks paranoid over this are likely also paranoid over the state of the US economy and predicting collapse in some near term. So why would these Chinese investors be voting with their wallets and investing here if soon there was going to be this big collapse? In one way or another these investments imply they think the future return is better than anything they can invest in at home. Well.. too big a topic for here, but weekend thoughts to ponder. The PBT has a list of the biggest residential real estate transactions in the region last year. Might be interesting to compare the new and old assessment values for each to the actual sales values recorded last year. So it was 39 years ago today that the US Supreme Court ruled against the Pittsburgh Press in the case of Pittsburgh Press Co. v. Pittsburgh Commission on Human Relations. The issue was whether the paper could have gender based want ads. So yes, it was nearly 4 years after man(kind) landed on the moon that local want ads continued to place most advertisements for receptionists in a "Female" section of the paper and most advertisements for engineers were in the "Male" section. What may be shocking is that the leadership of at least the Pittsburgh Press actually litigated this all the way to the Supreme Court trying to defend the practice as a moral imperative. For the convenience of the readers of course. You know.. I got nothing.. so maybe we will just pass on the big Pittsburgh promo piece in Delta Magazine for June. I honestly thought this all ran last year, but it says June so maybe they paid for the insert again? I dunno. Delta... Paris... fall will again be decision time I suspect for the direct flight to Paris. I honestly say yay for the restaurant and sincerely the best of luck. Let us all just not use the idea of a funky new restaurant to rationalize the lack of effort to address the more fundamental issues of the Mon Valley. Braddock remains a place where real estate prices have only recently dropped to levels not seen in an advanced industrialized country anywhere, where theft of interior pipes is a real factor forcing residents to leave , it is a municipality built on century old geography and where sheer lack of fiscal capacity inhibits any chance to build a better community. Policy defined Braddock's fate, not some unstoppable deindustrialization that is not our fault.. likewise it will take changes in real policies to change Braddock's path in the future. All the hard news stories of late paint a picture of the situation in Braddock getting worse if that is even possible. Our iconizing of the shell of a municipality reinforces many of the notions that we need to get past before real change happens. In many ways our focus on a few funky stories over the years really just distracts us from the harder questions we collectively don't want to answer. In fact I really feel a lot of the coverage of Braddock in recent years has gone so far as to enabled a feeling that we can place it into the "it's getting better" box despite the contradictory evidence of all hard metrics I know of and objective observation. Like the cupcakes that were going to save us all at one point, it really is much much harder than that. I guess I do take issue with any comparison of Braddock to Lawrenceville a decade ago. Let's skip the fundamental difference that Lawrenceville is a neighborhood within the city of Pittsburgh and that matters a lot. In no way did Lawrenceville have to support its own police, fire, nor any other municipal services... all by itself. Braddock's very problem is that it must exist as a self-sustaining municipality and its lack of fiscal capacity creates many of the problems it must overcome. Then don't forget that Lawrenceville a decade ago was a neighborhood built mostly around a hospital many knew would not survive long and in all likelihood leave a giant monstrosity of an empty shell sitting there indefinitely if not longer. The decision to put Children's Hospital where it now exists was a turn of events quite unexpected to all concerned. The hospital was actually slated to be built on 2nd Avenue and the machinations of fate shifted the geography only at the last minute. The real estate speculation in Lawrenceville can be dated to the announcement that Children's Hospital would be located on the site it now stands. Braddock may indeed be Lawrenceville of a decade ago.. but without the prospect of a major new hospital being built there. To pretend that and sheer proximity to a strengthening Downtown or Oakland is not a big part of the Lawrenceville story is in itself folly. The truth today is that the next round (and for those still in denial, there will be future rounds as well) of transit cuts will cut off most of the meaningful access of Braddock to the employment and service cores of the region. Lawrenceville, and lets throw in the South Side Flats, are some of the most accessible neighborhoods to Downtown and/or Oakland. I hope the new pioneers in Braddock have cars or are otherwise self-sufficient. So be happy... and eat heartily. Just to welcome the visiting dignitaries of the Pennsylvania League of Cities and Municipalities who are in town for a confab.... I'll just repost this old graphic that says it all below. If you like pain and want a high res PDF version is available as well. and as much as the lingering problems of Harrisburg persist, the headline of late is that Scranton, PA is now going over the fiscal cliff rather quickly. and get this. They voted unanimously! I didn't think the state house voted unanimously if there was a bill affirming the Commonwealth was part of the United States. What is the headline about? HEMAP, Pennsylvania's longstanding foreclosure prevention program mentioned here in the past whose defunding last year was about the apogee of bad policy. A program with wide bipartisan support... with very minimal cost, yet widely thought to be instrumental in keeping Pennsylvania foreclosure rates near the lowest in the nation. Could the senate not support a bill unanimously supported by the house? Could the governor veto a bill with that much support. Why was the program defunded last year in the first place? and why was this not news across the state? The Wall Street Journal has a pretty comprehensive look at the whys... and why nots... of using natural gas as an automobile fuel in the US. See: America, start your natural gas engines. by Tom Fowler. Worth a read since so much of the hope for natural gas markets.. and thus natural gas prices.. and thus royalties and the long term economic impact of natural gas production in Pennsylvania and environs.. seems to point back to this vision of America's automobile fleet switching away from gasoline. I did recently observe the second vehicle I've ever seen using the natural gas station opened to much fanfare in the Strip District. On closer inspection it turned out to be a vehicle owned by Equitable Gas itself as was advertised throughout its body paint. So in a sense that may not count. I am still really curious if there is a single resident of the City of Pittsburgh using a natural gas vehicle for their private conveyance? Anyone? Just one? Years ago there clearly were some folks in Friendship with a natural gas vehicle, but I don't think there are any today. So I am looking for someone other than someone working for the gas companies or otherwise directly subsidized to use such a vehicle I will stipulate. I bet we could get you some media coverage if you exist. Or is it the case that privately owned Natural Gas vehicles are outnumbered in the city of Pittsburgh by cars running on Vegetable Oil? Just asking the question is all. Anyway... the article points out some of the hurdles to getting natural gas into US automobiles; hurdles that the industry seems to just skip over if you read most of their prognostications. For sure it's not impossible by any means. I pointed out long ago that in the Netherlands there is a wide infrastructure at commercial stations to provide LPG (Liquid Petroleum Gas) which many cars there run. Still I wonder what the betting line would be on when the first station taking Fuelperks for natural gas comes into existance within Allegheny County. So I suspect I am not alone when I say I am almost shocked that former US Congresswoman Melissa Hart lost her bid just for the Republican nomination for the state senate seat she herself once held. By all accounts Hart has a lot of popularity within the region, but it clearly does not translate at the very least to inside the Republican Committee locally. It was not even a close vote. I guess the telling point may be the explanation from the victor Randy Vulakovich who said he wanted "Right now, my focus is on winning and bringing some normalcy back to the 40th District.". It would seem a strange comment. What lack of normalcy is there? But of course it is telling comment. The Rosetta Stone is Jeff Habay. Jeff Habay, whose mixing of political and official business led to his own conviction and set a precedent for a series of similar criminal prosecutions of politicians to follow. Once the rising star of Allegheny County Republican politics was elected to the state house at a very young age. Was considered on the short list of folks who might run for Melissa Hart's State Senate Seat only to lose out to one Jane Orie who was herself at the time holding the seat in the state house once held by Melissa Hart. Once convicted and dumped out of office Habay's brief successor (one Shawn Flaherty) was displaced quickly by Vulakovich who has now beat out Melissa Hart for the seat Jane Orie was evicted upon her convictions of charges similar to that which did Jeff Habay in. If you can keep all that straight, there is a certain circular firing squad aspect to it all. Of course it all leads to the postscript of what may be the best post-political (let alone post-conviction) makeover of a local politician ever: Movie voiceovers and Brazilian real estate. Darth Bernardo all in one. So the story is that while there is some very odd renumbering going on, the district of Jane Orie's tenure has been morphed to stretch into the city of Pittsburgh in order to cover the residence of the Jim Ferlo. Thus a fiction to say that Ferlo's district was not eliminated. Jim Ferlo's district, for the longest time held by one Len Bodack Sr. (Jr last we heard is working for the PWSA) stretched out along the Allegheny River Valley is pretty much kaput. So there is a special election coming up for the remaining term of Jane Orie which will be based on the geography of the existing district... but then the redistricting kicks in and then what is going to happen? The North Hills of Allegheny County is pretty much the core of the county's Republican Base and the new district pretty much covers it all. Thus the early prognostication that it is a Republican seat to lose. Yet it also sticks into the city and adds some core Democratic Party votes that were not part of the district before. So a map might help. So it may not be the best starting point, but for something to benchmark below I will put a map of the 2008 General election for President just in what will be the new district as proposed (still may change given the history... this is attempt #3 by the state to draw this map.. let's take a bet it is not the last). You see the sharp divide in the map. There is not a lot of middle ground. Like the national red/blue map it has a bit of spatial bias in that the Red areas are all a lot less dense with population than the Blue areas. So at the starting point there is indeed a palpable R margin. Not enormous as these things go for very local races, but comfortable. The wildcard here is how much has changed in 4 years. For a region like this it is not a question so much of how much the nation or state has shifted R or D, but the movement of people within the region which has a quicker impact. Generally speaking you have seen a suburban R shift in the Pittsburgh region reflecting, I speculate, mostly from the self-selection of folks moving out of Allegheny County. So if a chunk of R's have continued to move out of the county it is likely from a lot of this district and could have an impact if the margins are very close. You own a bicycle... I know you do. Since it is obligatory to comment on the annual Anthrocon convention which seems to be destined for Pittsburgh from now on. If you look at the latest jobs data just out for May, it is for Pittsburgh the highest job count for a May ever. No news there of course. But the growth in that sector is nowhere near enough to offset what is the lowest construction employment in the region for a May in many years. For one comparison there are 11,400 fewer jobs being reported in the construction sector in Pittsburgh this May than in May of 2008 which goes to show the impact of some large projects. Put in perspective a bit... if we had those 11,400 extra jobs this month it would be by significant margin the largest job count in the region ever. Alas I still say September will be a new all time job count for the region. This could be an uber long post,or it could be short and pithy. But if you think all the pension issues in the city are... if not say 'solved' but even if you would go so far as to say 'stable' there is a new iceberg in the water. There are about to be some big new major changes in the pension accounting rules put out by the Government Accounting Standards Board (GASB). And when I say major there are some that would conceivably shift the debate in the City of Pittsburgh to a new plain. As an aside... is the pledge ('pledge'... sounds like a public television pseudo advertisment doesn't it? About the same thing in context) of future parking revenue even a GASB compliant investment vehicle in the first place? Nevermind that. state and local governments, for the first time, to report unfunded pension liabilities on their balance sheets. That one in itself if bad, but bad on paper. Hopefully nobody thinks the unfunded liability is not there so it will not really change anything at the end of the day even if it gives ratings agencies pause. The really big thing is that the new rules are being reported to require pension actuaries to use a 3.5% rate of return assumption for their investments. I'd do the math on what I think it means if they used the 3.5% assumption here, but it is too scary. yes, that was the short pithy version. Or from my days on Capital Hill there is the this Senator summary which for this is: Bad. Dallas, Pittsburgh and what really killed the economy? I have a very serious question... a question that can't really be answered of course. 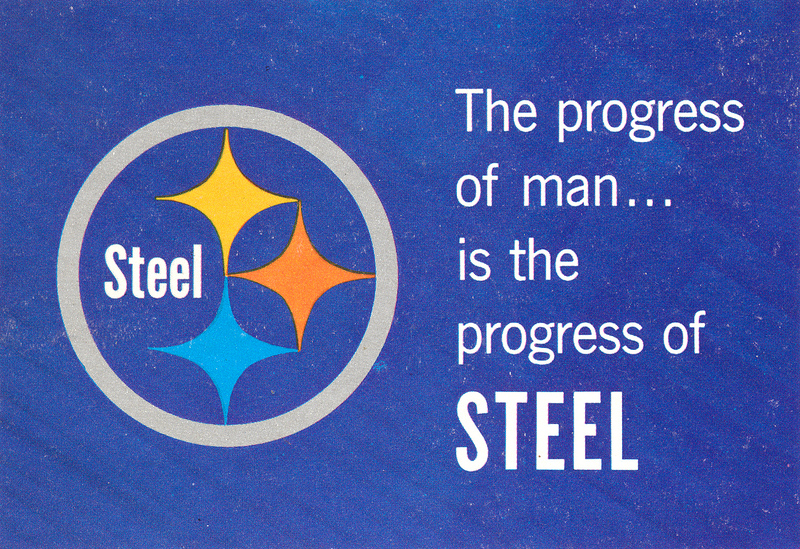 What was worse for the future of Pittsburgh in the long run? The decline of the steel industry in the 1980's or Michael Jordan's dismemberment of that which was known as Westinghouse in Pittsburgh? The question obviously arises on the understated news that Westinghouse Nuclear (just one piece of what was the big W) moves out of Monroeville. Westinghouse through history has meant more than ever really documented to the economy of Pittsburgh. In particular the vast Westinghouse Research and Development operation centered here was a unique source of innovation and entrepreneurship that would in many decades be missing elsewhere in the region. Lots of what we tout today as part of the 'new' Pittsburgh economy trace back directly to Westinghouse and would likely not be here if Westinghouse had not been here for so long. Put another way, what would the economy be in Pittsburgh today if Westinghouse had not collapsed? Remember, Westinghouse was not the casualty of the vast economic restructuring of American heavy industry. It was entirely a voluntary immolation on the part of Westinghouse's corporate governance. Michael Jordan came to town.... decided to buy CBS (yes, the TV network... maybe he watched too much of the original Dallas?) and then had Westinghouse became CBS in what may have been the most misguided reverse merger in history. That which was once Westinghouse was sold off, closed or otherwise deconstructed.. Michael Jordan took with him if not a lot of Pittsburgh, then a lot of its future and probably didn't lose any sleep over the fate of the Turtle Creek Valley. Jamie Dimon in comparison will likely only make a few big JP Morgan equity owners unhappy. The recent history of how the economy today connects to W is hard enough to capture, but the W history is in itself over a century long now. What was the first 'spinoff' (a term I doubt was used at the time) from Westinghouse's research? Trying to fix my water heater recently I think I found an answer to that? The electric water heater was invented in Pittsburgh. Who knew? One Edwin Ruud was a Norwegian immigrant who wound up in Pittsburgh working for George Westinghouse and along the way invented the water heater. You might recognize Ruud as possibly being the name on your water heater today. More from the Pittsburgh Press: Man with a heater or the patent itself, 19th century innovation at its finest, or a great ad from the Pittsburgh Press in 1922 for Ruud tankless water heaters. And with became of his water heater fortune? Most of it was given away to his workers, but also some created a music scholarship extant to this day and some went to found a hospital back in his native Norway that also seems to be around in some form. but yeah.... it was all J.R.'s fault. So forgive me a bit of selfish auto-recursion. Down in DC there are a lot of slaps on the back being passed around over the state of the Pittsburgh economy. Curious to me that this is all news now, but hey... better late than never. Still it all reminds me of my buddy David Brock and his attack on my untuous bafflegab not withstanding.... I sometimes wonder if he reads the blog. but he was not alone and lets look at 2005 and this editorial in the PBT: Stop Making Excuses.. skip to the penultimate sentence if you wish... It was not a time when saying positive things were taken kindly.. or at least credibly. For everyone who thinks there is any new story in any of the current positive economic story... it was just the next year.. at the end of 2006 when Pittsburgh's unemployment rate slipped below the national rate and has remained below the national rate ever since. So we are now 65 months and counting. The all-important inflection point in the economy must have come before that by definition. It was all a time when to even hint at any optimistic future for Pittsburgh would get you labeled a contrarian by most everyone. It was a weird time when almost all popular mythos were as negative as they were baseless. Though maybe we have new mythos to replace the old ones? OK.. returning to base course. Where in the world is Jim Ferlo's District? So I've had a few comments that folks can't figure out what district they reside in under the ever and yet again revised redistricting plan for Pennsylvania Senate and General Assembly. Maybe we should back up for those who missed it.. yes there are indeed entirely new political boundaries for the Pennsylvania legislature as of just last week. Still really just a plan in that if there is litigation we have this little problem of an understrength state supreme court these days that could keep the whole issue discombobulated for some time. The thing is... Pennsylvania's Legislative Reapportionment Commission (PLRC) actually for the first time this cycle had a whole web site focused on redistricting: http://www.redistricting.state.pa.us/ So progress yes? It was a good idea, and the site does have some info, but in the end it really was underused.. and per the comments I have had recently, still have left a lot of folks confused. 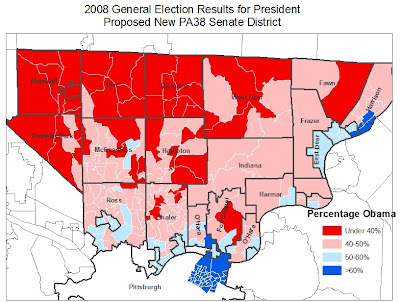 How bad was Pennsylvania's still unfinished redistricting process? Realize that the lawsuit that lead to the state supreme court throwing out the PLRC's main plan was based almost entirely on the work of a single 29 year old Republican Committeewoman from Allentown . So likely 6 or 7 figures of cash was spent and untold amounts of effort was spent to prodcue a map that one unpaid citizen did better on her own leading to the ongoing political convulsions since. We are now on the third set of maps and I am not so convinced they will be the last. Ok.. enough for the rant. So the PLRC did put up some data and maps. From comments I have had even from elected officials the maps are unreadable. But they do have the KMZ files some folks can use.. So I am not doing much other than taking those KMZ files and creating the links to make them usable by a more general public. House Districts for Allegheny County and Environs are here.. (had to subset it because the full state map was too big for Google Maps to use). So I saw a price for gasoline advertised at $3.35/gal the other day. I remember some goal of $2.50 a gallon being talked about in one of the presidential debates earlier in the year. I suspect when that was being bantered about gasoline in the region was right at $4/gallon. So in a sense we are just almost halfway to that nominal goal. via gasbuddy.com (link on the right) you can see the chart for how the trends have looked in the Pittsburgh region over the last two months. As for the near term future? Oil continues to drop around the world. CSM: Oil prices hit eight-month low in Asia. Natural gas itself is plunging again. (real time prices). I would not trust anyone's predictions in NatGas markets, but there was serious talk of ever more drops not long ago. If any of those predictions come to pass CHK will be in a lot more trouble than it is even today. So will a lot of other producers I imagine. Does not seem to be slowing down the development of new supply locally however. On airlines (connected only in that they use fuel as well I guess).. while there is an interesting controversy over a plan to get a new hub operation going in Pittsburgh, out in Philadelphia they are moving ahead with a multi-billion dollar airport expansion. So here is what the data actually says about jobs. Recent employment in the Pittsburgh MSA steel industry is a remarkably stable time series. It may be the most stable employment trend in the region. Literally unchanged at all in 12 straight months. Maybe employment is up, but it would be an interesting story why the data is showing such stability. If the data is remotely correct, there is no story at all of a big jump, nor of any big decline in steel industry employment. The story is how unchanged it has been of late. But that only says so much. Here is a graphic of the Pittsburgh MSA's share of US employment in primary metals industries. Still, a remarkably stable time series in itself. The very recent trend shows a bit of gains going into the recession as so much was shut down elsewhere while local plants, expecially E.T. held their own.. but as we moved out of the recession we have lost those gains in this relative sense. But does that mean all is good for local steel industry employment? The proportion of US jobs in Pittsburgh is stable, but even since 1990 the total number of jobs classified as in primary metals industries are down 40%. The only rebound nationally has been some bounceback from the nadir of investments at the most dismal point in the recession. 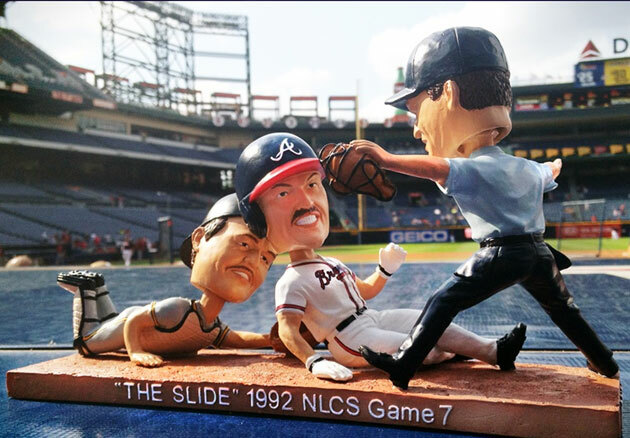 You know though... the Braves may have gotten it right. If you look at it, I would call it the Randy Marsh bobblehead. Deservedly so. Sid still spells the name wrong and I guess I updated this a day too early. So I will say this.... there is surely going to be a paper written after the assessment is over with an evaluation of whether the appeals process decreased the inequities in the assessment results... or if they made the inequities worse. Yet we know that there is a major effort underway to 'adjust' the assessment results with a focus on overassessments in some of the poorer communities in the county. Yet the article is clear that of the informal appeals heard, 43% resulted in a lower assessment by an average reduction of $37,805 for those parcels. Note that number. Now consider the communities that are thought to be overassessed? The article mentions specifically a focus on places like Braddock, Rankin, Duquesne and Clairton. What are the average asssessed values in those municipalities? I'll bet that it is not the municipalities thought to be overvalued that are getting an average $37.8K reduction in their assessments. The problem is that I think the public is getting confused with how this is all being reported. The stories about the appeals process is being written about almost completly independently of the story of potential overassessments. People I think are mixing up the two and thinking the appeals are fixing the overassessments in the news when most likely it all works out to be the opposite. Most skip over a lot of the corporate business news, but the machinations within Chesapeake Energy have risen to a certain level of public consciousness of late. Most likely because of the outsize role CHK plays in all things Marcellus. The specifics of the issues at Chesapeake really are in the end pretty classic when it comes to resource booms. Overconfidence and misunderstanding of economics always play a role. For me, and a lot of others the biggest inexplicable factor is why so many people thought you could produce so much more natural gas and somehow invoke ceteris paribus and just blindly believe the price will stay the same. Supply? Demand? Someone took econ 101 out there. Even if Ceteris Paribus is a convenient fallacy in itself there was no rational reason to believe prices would not retreat in the face of a massive new supply coming online. Yet that seemed to be the message. Hold the thought that somehow there would be... still might be someday.. the big transformative shift in demand for Natural Gas in the US... autos using NatGas... new international exports of NatGas.. etc.. etc. I don't doubt any of that, but I am quite sure the time frame for any of that to happen is a lot longer than companies like Chesapeake were suggesting to their current or potential investors. Let's talk about those investors. You can summarize the problem just looking back at one of Chesapeake's quite extensive investor presentations from last year. For context it might be worth noting that the price of front-month natural gas was dropping already and so was CHK's stock price. The question as it always is for investors is what would the future hold? Here is one page that pretty much encapsulates it all from CHK's October 2011 investor presentaion. Note first their general prediction of possible prices for natural gas in the future.. Then quote at the bottom is remarkable. They seem to be trying to say that right NOW is the time to really jump in. That the optimal investment point was just past and the public was on the verge of missing the boat so get ought to get in quick (my paraphrasing but if that was not the message what was?). Everyone thinks they can time the market. So in this one slide they are trying to say that for both the short and long term it is the time to buy their stock. A no brainer. You can go and look up how the stock price of CHK has fared since October. And don't forget.. we are now well into the period where producers have been cutting back production because prices have dropped so much. As of yesterday it seems to not have dampened the growing oversupply of the market and new price drops. So NatGas has dropped in price back to where it was when the announcements of production cutbacks began. In the longer term the price suppression may not go away quickly since everyone is saying there is all sorts of new supply shut in by lack of pipelines to get it to market. Mark my words... September, this September for the record... let's not even think about September 2013, will be interesting in the NatGas markets as supply potentially physically exceeds the capacity to store it in the US. But to be a bit gratuitous and go back to CHK's stock price. They really were not shy. From last October still they actually were predicting their stock price was going to triple.In reality the stock has been cut in half since a peak early last August. August may seem like ancient history, but never fear; hubris is eternal. Though they did include a question mark in the slide title.. A bit reluctantly I bet. I would have thought this would be viral locally by now, but seems to me lots have not heard of the legal case so much more interesting than assessments... aka Textgate. In a California court a 'fan' has sued the Pittsburgh Penguins for texting him too much. Unless this is some elaborate prank, the allegation is that despite signing up for no more than 3 texts per day, the Penguins actually sent out 5 texts one day. Read more via the Consumerist, but the actual court filing itself is online via Deadspin. I don't quite have it in me to wade into the ever and yet again ascendant assessment issues in Allegheny County.... leaving me a bit factoid deficient for the day. So apologies a bit for the echo chamber-ness of this, but Jim R. has some interesting catches for the day. One is a whole story: From Rust Belt to Exporting Giant. Nice pic... amazing how the fountain is always functioning so well. I swear these photos will be 2-3 skyscrapers behind the times before the media starts using current versions. We might need some Photoshop assistance in the end. But the article there does have one very interesting factoid. If you check out the latest stats on international trade for the Pittsburgh region (link there on the right has the data fyi) a factoid pops out. Between 2009 and 2010 international exports from the Pittsburgh region jumped from $8.3 to $12.2 billion. As a percentage it is one of the biggest metro area jumps. Part of that follows from a pretty depressed 2009, but still looks like a new peak value for international exports for Pittsburgh in 2010. Before anyone gets jumping to conclusions... what is the biggest export from Pittsburgh... and what saw the biggest jump in export value between 09 and 10? Coal. Hard black stuff. Pittsburgh's disruptive technology of 1783. Remember when I said that one of the overlooked issues impacting the region are the coal-jams on the high seas. Anyone have any local info on him? Goldy would know more, but I would presume this is the final report of Torpedo Six in the Battle of Midway. Just amazing. 10 of 14 planes shot down in operations described merely as " Torpedo Attack delivered against Japanese CV's accompanied by BB's, CA's, CL's and DD's." and signed by a jg in the end. I don't think I've ever read a story of a Pittsburgher involved in the Battle of Midway. Any leads? So here in town the topic of 'Regionalism' always breaks down quickly into to two irreconcilable camps. Those who think our hyper fragmented local government in Allegheny (one of the most fragmented in the nation by the way, if not the most fragmented in the world) is costly and inefficient and those who perceive the opposite as a movement toward one big 'metropolitan' government. Both sides are wrong IMHO. Those who say fragmented government is expensive never really look at what the expenses are of our smallest municipalities. If you have few or no cops, no professional fire department and rely on the state police or the county for much of what larger communities pay for then guess what... low cost. They may not be effective and really are foisting costs onto other taxpayers, but they are not costly to the local taxpayer. On the other side, there are so many ways to deal with the situation and few rise to the level of creating some 'mega' government that technicially has no legal basis at the moment and really is not on anyone's agenda. But that paranoia exists. When I wrote about the notion of Cleveburgh I really had notes and comments from a lot of folks attacking the idea on the presumption I envisioned some combined local government. At the end of the day both sides argue past each other and nothing moves the status quo much at all. Anyway. Years ago I wrote: Why Regionalism is so hard looking at our long long (I mean really long) history at fighting over this vague notion of 'regionalism'. But I see a story up the turnpike from Cuyahoga County that pretty much epitomizes the solution I see to dealing with our much more extreme fragmentation here. See: Cuyahoga County offers services in pursuit of regionalism. A long time ago I was studying Russian and my Russian instructor had what I still think is one of the more insightful snippets of political wisdom. He said (as I can remember): "In your country, economics determines politics; in my country politics determines the economy". And so it goes I guess. Everyone seems to say the current economic trends will determine the fall election. We will see. Still the world has changed. So much that now you find the best industry and investment analysis coming from the Ukraine? That all just came to mind reading this: Are you ok? сланцевый газ и металлургия США. The source says it is FundMarket: the Stock Market of Ukraine. or if you prefer read the Google translation of the same: Are you ok? Shale Gas and Metals in the US. It really does cover it all well. Now ask yourself why there is interest by Ukranian analysts in the state of demand for steel in the US? Might be because of the growing role of Russian investments in US steel production? So here is one way to parse some of the labor force data that came out earlier in the week for the region. While not the top, all I will say is that if this type of benchmarking was done going back in history, for an awfully long time I would bet we placed in the bottom quartile pretty consistently. When you then factor in that a lot of the places near the top are places that still get a lot of international immigrants coming into their workforce, it is remarkable we are even close. Don't ask me what is up with Cleveland.